Clothing/Jewelry Description A hooded sweatshirt, a blue jacket and blue jeans. Medical Conditions Jones suffers from bipolar disorder and is required to take daily medication, which she left behind. Distinguishing Characteristics Caucasian female. Brown hair, blue eyes. Jones has a small scar on the front of her neck at the center, a skin discoloration on her buttocks and a crescent-shaped scar on her left arm. She has a tattoo on her right shoulder of the name "Kimmie Sue" and a red rose with the name "Jack". Her nicknames are Kim, Kimmie and Kimmiesue. Jones wore her hair shoulder-length at the time of her disappearance, with bangs. She speaks with a quiet, raspy voice and has a shy disposition. 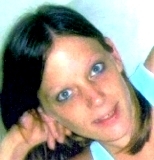 Jones was last seen at her apartment in the Pinewood Village apartment complex in the 2500 block of Beverly Street in Parkersburg, West Virginia at 11:00 p.m. on February 2, 2009. She had spent the day with her ex-boyfriend, Jack Crone, their five-year-old daughter, and Crone's wife, and they all had had dinner together. Crone said he drove Jones back to her apartment, dropped her off in front of the building and drove away without checking to see whether she actually made it inside. She has never been heard from again. Jones had received a death benefit pension check as a result of her father's death, and it disappeared with her. After her disappearance, a stop payment was put on the check. No one ever attempted to cash or deposit it. Her family stated Jones was behaving normally just before she went missing. There were no indications at her home that she had planned her disappearance; her calendar was marked with upcoming appointments, and she left all her personal belongings and clothing behind. She did not own a vehicle. Jones is considered to be endangered because she is without her medication, and because of her high-risk lifestyle and extremely trusting nature. Foul play is suspected in her case, which remains unsolved. Updated 8 times since October 12, 2004. Last updated March 6, 2019; two pictures added, distinguishing characteristics updated.